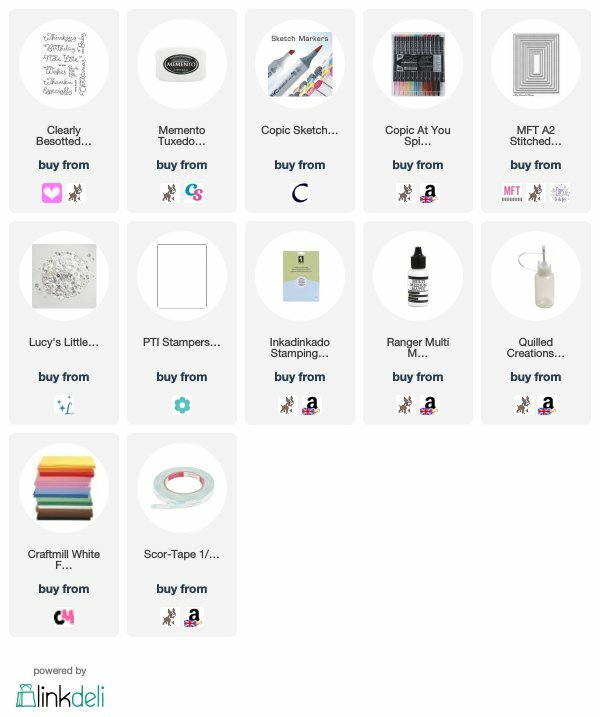 Hello there and welcome to day three of the Clearly Besotted June 2018 Teasers. Not long to wait now, all the new sets will be available to purchase on the 1st June. 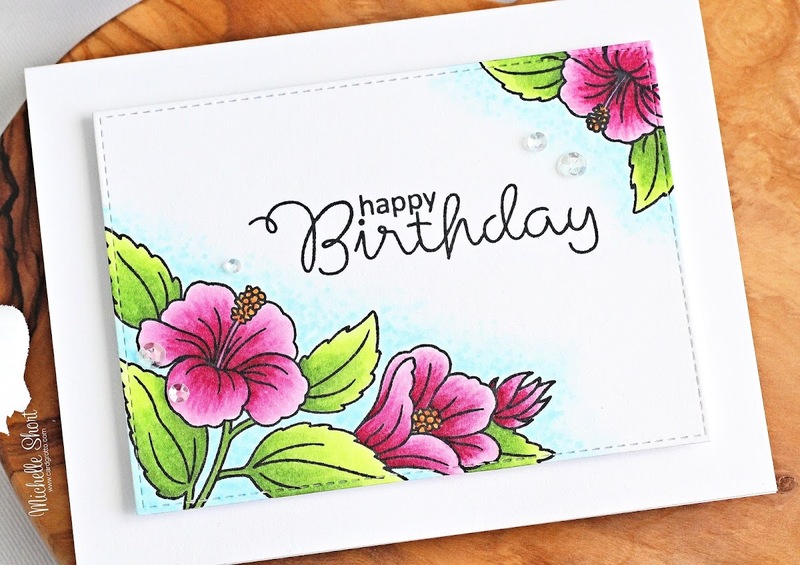 Today I am using the beautiful new Happy Hibiscus stamp set. I started off with panel of cardstock that was cut using one of the MFT A2 Stitched Rectangles Stax dies. I then stamped the hibiscus grouping image from the Happy Hibiscus set on to the bottom left with black ink. I took the individual hibiscus image, as well as the leaf, and stamped these in the top right hand corner of the panel, masking the flower before stamping the leaves. The image was coloured using Copic Markers (the colours I used are listed below the supplies section). I also added a little Spica glitter pen to the stamens on the flowers. I took the 'happy birthday' sentiment from the Scrumptious Script set and stamped this on to the panel with more black ink. The panel was added to a white A2 card base with foam sheet and DST. To finish off, I added a few Ice Crystal Sequins with Multi Medium Matte glue. COPIC MARKERS: Hibiscus flowers - RV69, RV63, RV55, RV52, YR18, YR15, YR12. Leaves - YG67, YG17, YG23, YG03, YG01, Spica Buttermilk 16. Outside shading - B01, B00, B000, B0000. 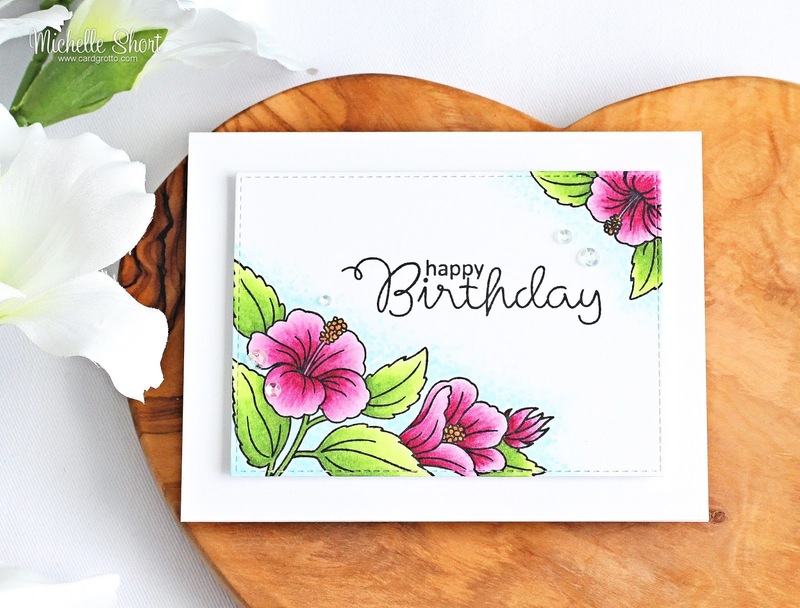 There are some beautiful sentiments in the Happy Hibiscus set, but I just love the font on the Scrumptious Script sentiments and thought it would work well with the image. For more inspiration on using the new sets, please head over to see Stephanie. Not only will she have some amazing projects to share with you, she will also have links to the other DT and guests sharing today. Thanks so much for stopping by today, see you later for my MFT post. This is an adorable card ! I love this stamps set, and with your coloring, the result is really beautiful !